Your eyes do not deceive you. 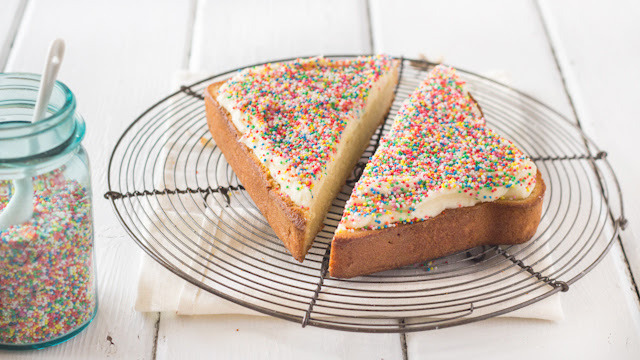 It's cake that looks like a giant piece of Fairy Bread. 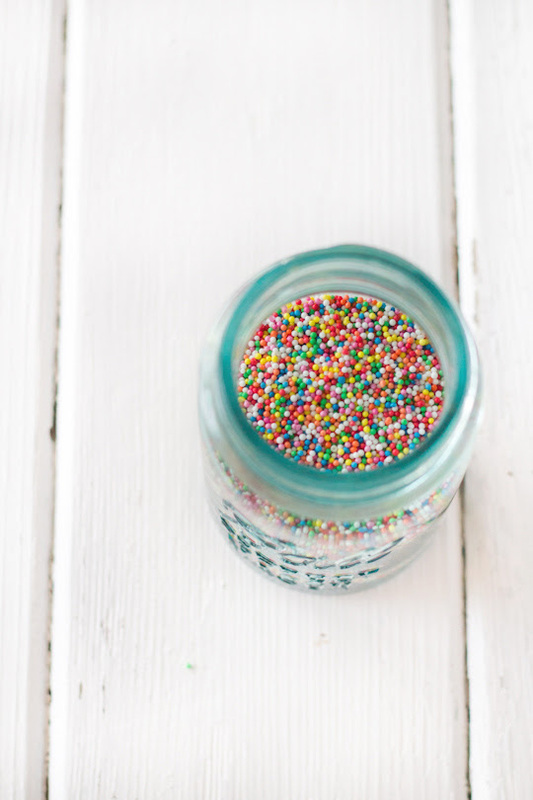 Fairy bread is such a funny thing, so many of us grew up with it as children in Australia but I've seen it receive mixed reactions from other people around the world. I guess it's just something you have to grow up with. I think it's pretty awesome. But I would, I love ANYTHING with sprinkles. Especially rainbow sprinkles. I'm so in love with this cake because it combines so many of my favourite things. Sprinkles. Cake. Desserts that look like giant versions of other desserts (you might have seen my Giant Tim Tam Cake). This is the kinda thing that makes me happy. I truly believe that most desserts can be improved with the addition of rainbow sprinkles. Sure it's just sugar and food colouring (which is the root of evil in the eyes of many people these days), but there's something about 100s and 1000s that's so whimsical and fun. I especially love this cake because it's such a simple idea. A plain vanilla pound cake, which I managed to bake into the shape of a perfect slice of bread (thanks to Lisa who let me borrow her cakewich pan), slathered with a salted butter icing and topped with lots and lots of happiness. Of course it wouldn't be fairy bread unless it was cut into triangles, right? Since I'm not usually a fan of spending money on single-use kitchen appliances, I would suggest trying this recipe in a square pan instead of the cakewich pan. It won't be quite as cute, but once it's cut into triangles you'll get pretty much the same effect. Since the recipe is for a vanilla pound cake, it is quite dense and moist so you need to ensure you don't overbake the cake as this will make it dry and hard. I took my cake out as soon as a skewer inserted into the centre cake out just clean. Alternatively you could use your favourite vanilla butter cake, sponge cake or chiffon recipe. 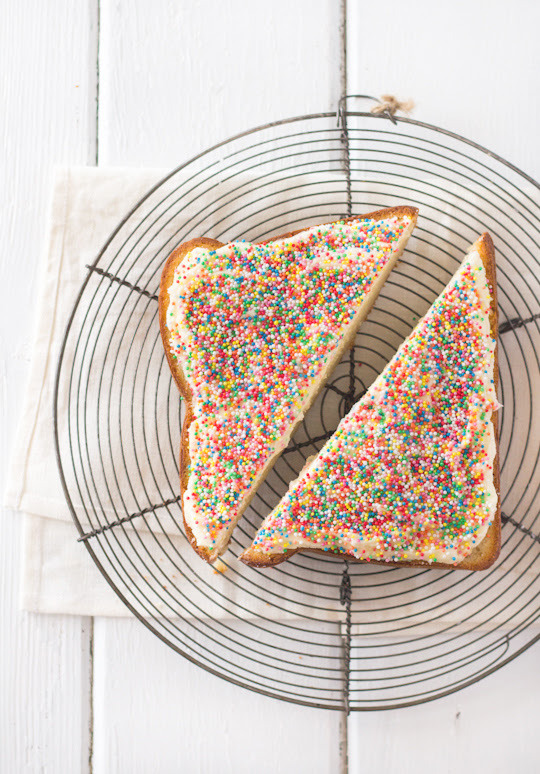 I think it's a great treat for kids and for the kids at heart, and even people who don't like fairy bread will enjoy it. Everyone needs more sprinkles in their life. For the cake, set the rack in the middle of the oven and preheat to 160°C (315°F). Grease the inner bottom surface of your Cakewich pan, alternatively you could try using a 20cm square cake tin that is greased and lined with baking paper. Combine the flour, baking powder and salt in a bowl, mixing well with a whisk. Whisk together egg whites and milk in a medium mixing bowl until just combined. In large mixing bowl with an electric mixer, cream butter and sugar for about 5 minutes, until light and fluffy. Add vanilla and beat vigorously. Reduce the speed to low and add one quarter of the flour, then one third of the milk mixture, mixing until just combined and scraping down the bowl after each addition. Repeat until all ingredients are just combined. Scrape down the bowl with a rubber spatula. Pour the batter into the prepared pan and smooth the top. Bake for 50-65 minutes, or until a skewer inserted into the center comes out clean. Cool the cake in the pan on a cooling rack for 1 hour, then unmold it to finish cooling right side up. Prepare the icing; place butter in a mixing bowl and beat on high with an electric mixer until smooth and fluffy. Gradually mix in icing sugar, add milk and then beat until light and fluffy. To assemble the cake, use a serrated bread knife to slice off the “dome” of the cake. Use a spatula to spread your prepared icing over the top. Cover the icing with 100s and 1000s/rainbow sprinkles (I placed my cake on a wire rack which was sitting over a baking tray to catch any sprinkles that overflowed). Can be served immediately or stored in an airtight container at room temperature for a couple of days. This is the CUTEST thing ever! I loved fairy bread, I used to always bring it in when we had bake sales at school! haha. Only you can come up with an idea like this steph. Love it! This is SO cool! Fairy Bread was absolutely my favourite party food when I was a kid. I wouldn't even say no to a piece now! Great job! So cool! 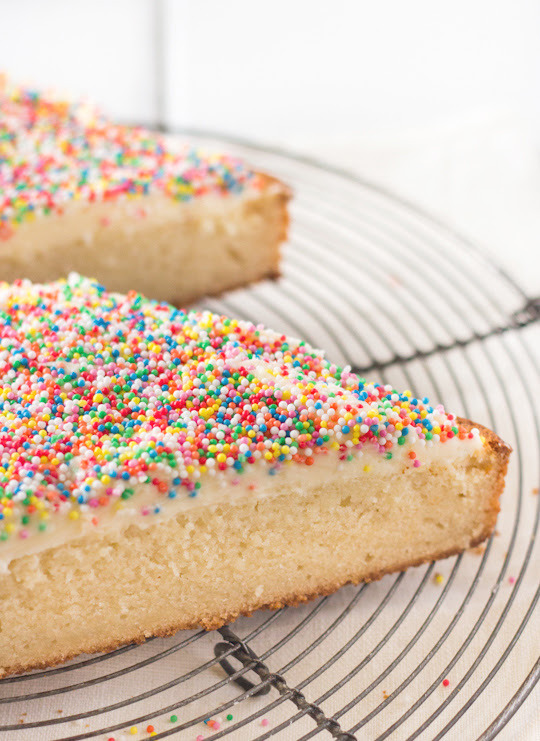 Fairy bread was a big thing for me as a kid, and having it as a cake is a great idea. you are bloody amazing! i love all things hundred and thousands! cant wait to replicate this! omgoodness, this is genius!!! I need to find a bread shaped cake pan so that my life can be complete! This is great! Love that cake tin, might have to buy one. such a clever and gorgeous concept!! It's a very cute and simple idea. I love it! I like fairy bread and at first I thought it was big piece of bread. It's giant... it's sprinkled... what more can you ask of a dessert? The trick of mind worked perfectly for me, my first thought was "oh. toast with sprinkles" but nooo! Haha. Love it!!! Seriously cool cake, and such a great idea! that cake looks so cute. i never had a fairy bread but i am definitely going to fix myself one after i finished writing this comment. i hope i have some nonpareils left. we used to have buttered toast with chocolate sprinkles like the dutch "hagelslag"
Fun, fun, fun! It's so cool that your blog is one of the Top 5 Food and Wellbeing blog in Voices of 2013! Absolutely love this! Could not believe it when my American and English friends hadn't heard of fairy bread! Goodness I can´t stop looking at it... soo pretty! Wow, this looks so fun and tasty! 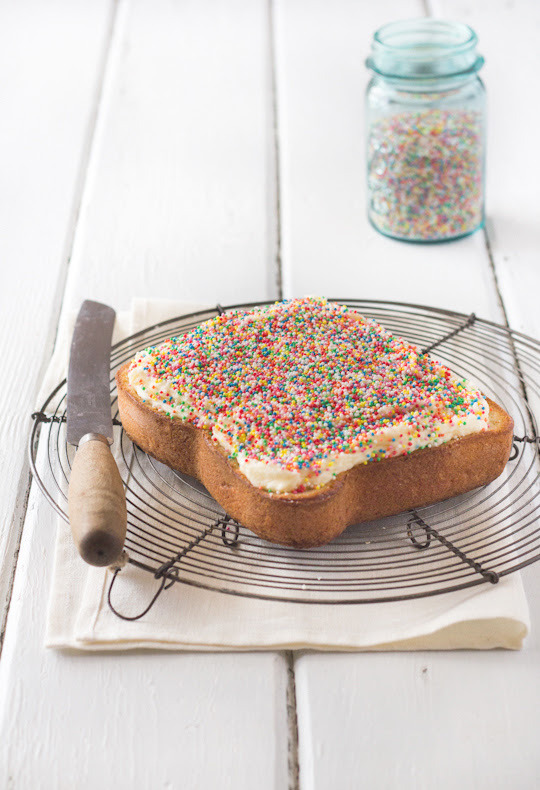 I have never had fairy bread but this needs to change after seeing this - sounds fantastic! So adorable! I've never heard of fairy bread either! 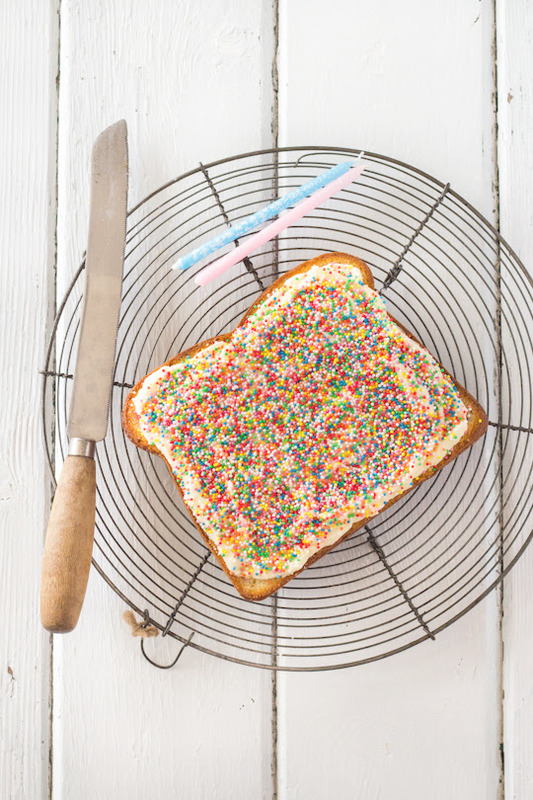 I have DEFINITELY heard of fairy bread and have consumed plenty of it in my time....but as a cake, pure genius! 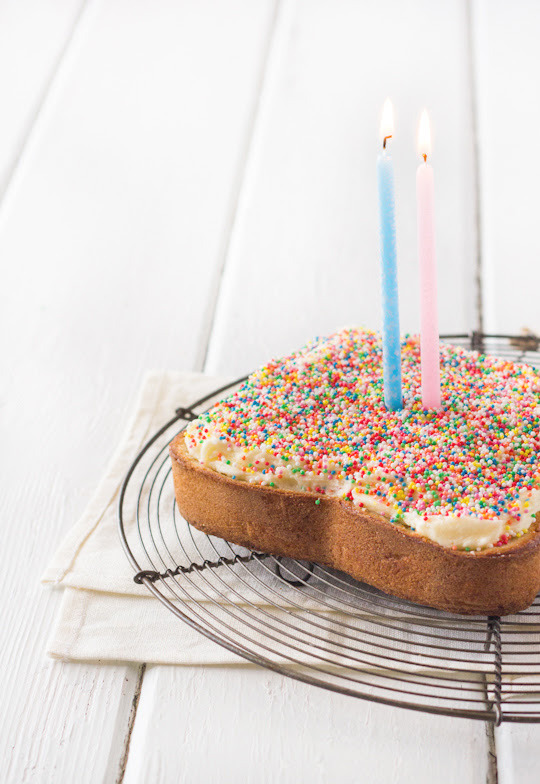 how did you make the cake in the shape of a slice of bread? I've never seen a pan in that shape. Hi Kelley, I used a cakewich pan from Fred. If you click through to the recipe on Kidspot there is a link to the pan. Yes!! Love fairy bread so much. The idea of having salted icing is so genius,its that interesting combination of sweet and salty that makes fairy bread so great. What do you need urgently? The cake pan?